We are finally finished with the T-Mobile UnCarrier 4.0 press event, so the news is already official. T-Mobile is indeed going to pay Early Termination Fees (ETF) for families who transfer service from AT&T, Verizon, and Sprint. Word of this move has been reported a number of times, including from us thanks to a reader who spotted an ad for the initiative last night. T-Mobile could pay up to $650 per line for you to switch over to their service. $300 of that comes from trading in your old device. You may or may not see that much, obviously the price is dependent on the device, how old it is, the condition, etc. The other $350 comes when you get your final bill from your old carrier that shows your Early Termination Fees (ETF). By uploading your bill or mailing it in, T-Mobile will assess it and then mail you the cash for your fees. Again, up to $350. You have to switch from Verizon, AT&T, or Sprint. You have to sign-up for a postpaid Simple Choice plan and also buy a device, which can be done for $0 down, but with a monthly payment spread out over 24 months. If you are an existing T-Mobile customers in an older plan or contract, you can switch as well to a Simple Choice plan without incurring migration charges. The rest of the details can be found in the press release below. LAS VEGAS – Jan. 8, 2014 – One year ago at International CES, T-Mobile US, Inc. (NYSE: TMUS) threw down the gauntlet, promising relief for customers fed up with a broken, arrogant wireless industry. Since then, the company has delivered on its promise with a relentless barrage of Un-carrier industry innovations. In its latest move, T-Mobile is eliminating one of the last remaining obstacles for individuals and families wanting to switch from AT&T, Sprint or Verizon to the Un-carrier by offering to pay off their early termination fees. With an eligible phone trade-in, the total value of the offer to switch to T-Mobile could be as high as $650 per line. Customers have been flocking to T-Mobile for its no annual service contract Simple Choice Plan, industry-leading JUMP! (TM) upgrade program, unlimited global data at no extra charge in 100-plus countries, and most recently for Free Data for Life on every tablet – up to 200 MB of free 4G LTE data every month for as long as they own their tablet and use the registered device with T-Mobile. 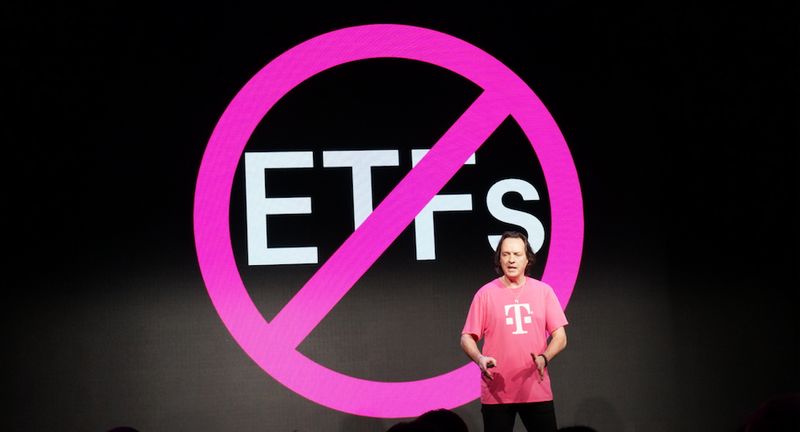 But Nielsen research suggests up to 40 percent[i] of families hold back from switching because of high early termination fees (ETFs), and a recent online poll conducted by GigaOM suggests that 78 percent[ii] would switch to T-Mobile if their ETF was paid. ETFs can cost as much as $350 per line. Multiply that two, three or four times for a family, and switching becomes an extremely expensive proposition. Starting tomorrow, customers from the three major national carriers who hand in their eligible devices at any participating T-Mobile location and switch to a postpaid Simple Choice Plan can receive an instant credit, based on the value of their phone, of up to $300. They then purchase any eligible device, including T-Mobile’s most popular smartphones, now priced at $0 down (plus 24 monthly device payments, for well-qualified customers). After customers get the final bill from their old carrier (showing their early termination fees), they either mail it to T-Mobile or upload it to www.switch2tmobile.com. T-Mobile then sends an additional payment equal to those fees, up to $350 per line. Trade-in of their old phone, purchase of a new T-Mobile phone and porting of their phone number to T-Mobile are required to qualify. This offer to pay early termination fees provides families with a quick way to escape carrier contracts that have deterred them from pursuing a better and more affordable wireless experience with T-Mobile. T-Mobile is also making it easier for its longtime customers to migrate to Simple Choice plans as well without incurring any migration fees. To qualify for this option a current customer under contract trades in their current device and purchases a new T-Mobile device and switches to Simple Choice. In addition to waiving the migration fee, T-Mobile will also eliminate the existing annual service contract for that customer’s line. With a Simple Choice Plan from T-Mobile, families start with one line at $50 per month for unlimited talk, text and Web with up to 500 MB of 4G LTE data. They can add a second phone line for $30 per month, and each additional line is just $10 per month. In short, a family could get four lines for just $100 per month (plus taxes and fees). The potential savings are so significant that if every single AT&T, Sprint and Verizon customer switched to a Simple Choice Plan, T-Mobile estimates they would save up to $20 billion [iv] collectively each year. In addition to great family plan savings, individuals and families can also enjoy an incredible wireless experience thanks to T-Mobile’s rapidly expanding nationwide 4G LTE network- now the fastest[v] in the United States. For more information, visit the T-Mobile newsroom. As America’s Un-carrier, T-Mobile US, Inc. (NYSE: “TMUS”) is redefining the way consumers and businesses buy wireless services through leading product and service innovation. The company’s advanced nationwide 4G and expanding 4G LTE network delivers outstanding wireless experiences for customers who are unwilling to compromise on quality and value. Based in Bellevue, Wash., T-Mobile US provides services through its subsidiaries and operates its flagship brands, T-Mobile and MetroPCS. For more information, please visit http://www.t-mobile.com.